It's been a drive-heavy two months for Curiosity. Since my last update, the rover has drilled at a site named Sebina, then traveled about 500 meters to the south across increasingly chunky-looking Murray rocks to a new attempted drill site at Precipice. Unfortunately, instead of drilling, they encountered a new problem with the drill instead. They should have now driven away from Precipice, just a bit to the north, to (perhaps) a new planned drill site. A more amusing problem encountered in the last two months has been the tendency of wind to blow away the fine dust generated by Curiosity's drilling and dumping activities. It's frustrating, but it's also cool to see change happening so quickly on Mars. This week, the science team is at the American Geophysical Union meeting in San Francisco; there will be a press briefing tomorrow at 11:30 PST / 14:30 EST / 19:30 UTC. It should be available by webstream here. I think this is a good time to get an overview of Curiosity's landed mission. Curiosity is now more than four Earth years, two Mars years, 1500 sols, and 15 kilometers into its mission. Here's a map documenting the progress to date, with all the drill sites marked as open circles. A wide view of Curiosity's traverse from landing through sol 1536. The base image is from Mars Reconnaissance Orbiter CTX, colorized with Mars Express HRSC image. The route is copied from official mission maps and Phil Stooke's maps. Yellow hash marks denote rover odometry. White circles represent drill sites; filled circles mark a few locations along the traverse between Yellowknife Bay and The Kimberley where there was some science but no drilling. The future route map is based upon the proposal for Curiosity's second mission extension. As you can see from this map, Curiosity has been drilling fairly frequently since arriving at Pahrump Hills. Many of the drill sites since Confidence Hills have been in the Murray formation, a thick pile of sedimentary rock made mostly of grains so fine that they aren't individually visible to Curiosity's cameras. You might be asking: why are they drilling so frequently in the Murray? It's because, as they drive, they have been traveling upwards through the rock unit, and therefore forward through the time recorded in the many Murray layers. They're drilling at fairly regular intervals in order to systematically survey how the minerals and composition are changing through time. Confidence Hills was at an elevation of 4460 meters below Martian mean. 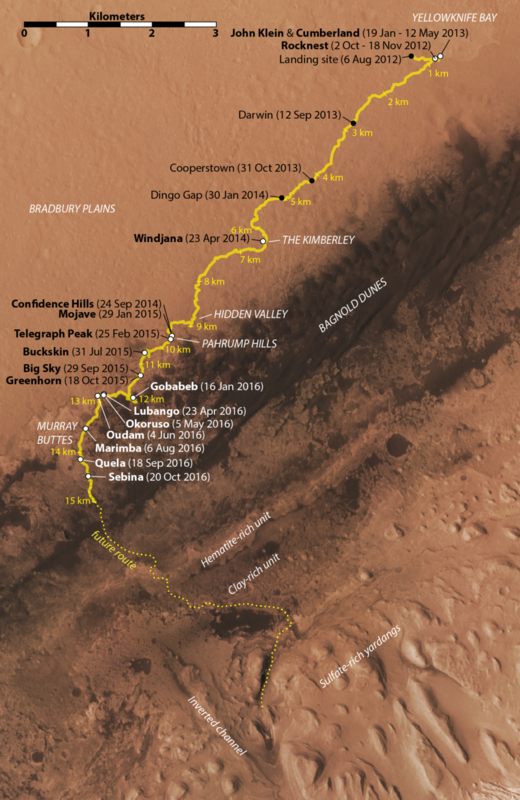 As of Friday, the rover was at an elevation of 4336 meters below mean, so it has traveled upward through 124 meters of the Murray formation. The team estimates the total thickness of the Murray from Confidence Hills to be 180 meters, so they're about two-thirds of the way through it. It'll take about 1500 more meters of driving to cross the rest of the Murray to the next unit with a distinctly different appearance as seen from orbit, the hematite-rich unit. The most recent successful drilling activities, at a site named Sebina, began with APXS and MAHLI chasing the Quela dump pile across the rocks. Before Curiosity can drill, it must clean out the drill and dump out the remaining sieved sample from the previous drill hole. The team typically analyzes the dump pile with the APXS elemental composition analyzer and MAHLI camera to compare and contrast with previous analyses on drill tailings (the material piled up around the drill hole) and the pre-sieve dump pile, material coarser than 150 microns that didn't make it through the fine sieve, which is discarded before they deliver samples to SAM and CheMin. Curiosity tried to perform science on the Quela dump pile on both sols 1493 and 1494, but on both sols the wind blew the fine dust in the pile, shifting its position away. I think they finally got some science on the moving pile on sol 1496. The shifting dust is kind of annoying and kind of funny but also a danger to the MAHLI camera. Blowing sand isn't likely to damage the camera, but the finer stuff generated by drilling is very sticky, and could attach itself to the front window, never to be wiped off. So there is a new rule in place to keep the MAHLI cover on whenever they hold MAHLI very close to drilled powder. The MAHLI cover is a transparent window that was completely coated with fine dust during landing. With the cover on, MAHLI can still see plenty of detail, but its rich color capabilities are compromised. That's not a big deal for science because MAHLI can see color from farther away and still get the detail from up close with the cover on. But it does mess up my beautiful drill hole montage. Sebina, drilled on sol 1495, was imaged in high resolution only with the MAHLI cover closed. They drove away on sol 1499, making it another relatively quick drill stop. In the drill hole montage below, I've used a more distant photo with nice color from MAHLI taken the next day. I'm not sure which image is the best to use for closeup drill imaging, going forward -- the dusty window image, or the distant image. I may need to switch to using distant images. As of December 2016, Curiosity has drilled and sampled at thirteen locations on Mars. 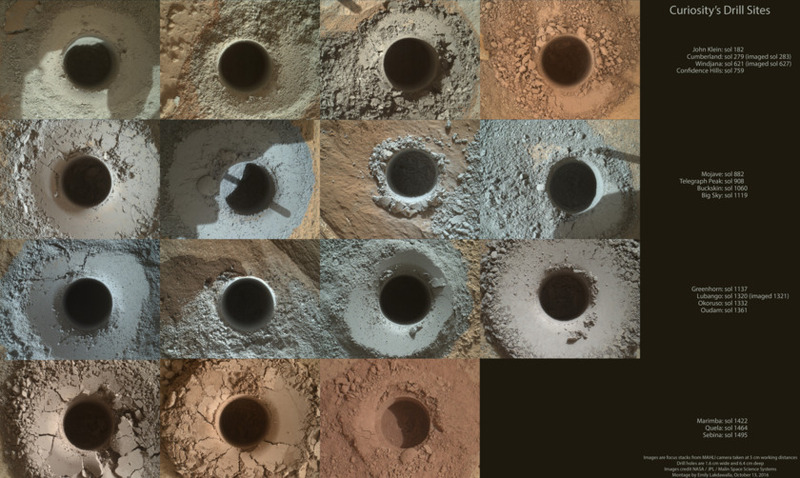 They are (left to right and top to bottom): John Klein, drilled on sol 182; Cumberland, on sol 279; Windjana, on sol 621; Confidence Hills, on sol 759, Mojave, on sol 882; Telegraph Peak, on sol 908; Buckskin, on sol 1060; Big Sky, on sol 1119; Greenhorn, on sol 1137; Lubango, on sol 1320; Okoruso, sol 1332, Oudam, sol 1361; Marimba, sol 1422; Quela, on sol 1464, and Sebina, sol 1495. All of these images were taken with the MAHLI camera on the end of the arm from a distance of about 5 centimeters, except for the Sebina one, which was taken from 25 centimeters away and enlarged to match the extent of the others. The drill holes are 1.6 centimeters wide. In the ensuing three weeks, the rover drove every possible sol. Here's the most up-to-date route map from Phil Stooke. The rock around the rover appears much more fractured and fragmented than it used to, with a lot of tilted blocks. It seems like it would be rough terrain for driving, but it's not as bad as it looks. Because the path is generally uphill, the rover drivers have excellent information about topographic hazards from the rover's navigational cameras, and they have generally been able to steer around the blocks and maintain a steady driving pace. You can see that as Curiosity moves south, it's getting into some isolated patches of dark dune sands, which always make for pretty scenery. In general, the rock textures are getting more interesting, too. The rover spotted an isolated meteorite and zapped it with ChemCam on sol 1505. The Murray rocks are showing a lot more color variability than in previous locations, and the patterns that the veins are making in the rocks are getting more spidery -- the veins seem to be more pervasive, often interleaving with thin layers of original rock. Below is an image of a typical outcrop from sol 1512. I selected this particular one because of the funny sand circle at upper left. That's what is now happening whenever Curiosity leaves APXS pressed against a rock overnight. During the night, wind hitting the turret drops sand around it. Some of the sand is swept onward, but some of it gets stuck around the nose of APXS, leaving behind a distinctive ring when Curiosity puts the instrument away again in the morning. On sol 1526, Curiosity pulled up to another intended drill site called Precipice. Here they were planning to attempt a new drill method. Curiosity's is a percussion drill, which uses both rotation and hammering to advance the broad bit into the rock, powdering the rock along the way. Recurring shorts in the percussion mechanism have slowed the mission and led to worry about possible failure of that part of the drill. So at Precipice they planned to try drilling using rotation only. This wouldn't work in a hard rock like basalt, but the sedimentary rocks that Curiosity has encountered have been quite soft, and Earth testing has shown that rotation-only drilling should be successful at penetrating the rock and creating the fine powder needed for the instruments. Unfortunately, the test wasn't to be. It didn't even begin, because a brand-new problem cropped up in one of the drill's other two motors. It has a drill feed mechanism that slides most of the drill assembly forward as drilling takes place. During the drill attempt on sol 1536, there was a fault in the drill feed mechanism, so the bit never touched the rock. Unlike the problem with the percussion mechanism, a failure of the drill feed mechanism would be catastrophic to the mission's sampling science; if it doesn't work, there is no sampling. So the mission took several days to try to understand the problem. In a news release on December 5, the mission narrowed the problem's origin to either the motor brake or an encoder (a device that lets the rover sense how much the motor is rotating). As of December 9, the drill feed worked again "using standard commands," according to Lauren Edgar, which is fantastic news. I haven't yet seen a complete explanation for the drill feed problem or what its implications are, but any news that indicates that the feed still works is welcome. Because the drill feed mechanism worked, the team got the go-ahead to drive away from the Precipice site. They've chosen to drive to a slightly different location to "investigate some interesting fracture patterns" -- it's not clear to me whether they intend to drill at this new location or not. I'm sure there will need to be more drill testing before their next drill hole. While the team was troubleshooting the drill problem at Precipice, they performed quite a lot of other remote sensing and contact science investigations, including the dumping of the remaining Sebina sample. This time, unlike with the Quela dump pile, they put APXS on the pile right away, rather than waiting for one day. This is actually how they used to do it earlier in the mission, but it requires the rover planners to make a guess at where the dump pile actually landed. They usually guess pretty close to right, but sometimes they end up spending a night doing APXS of a spot next to the dump pile. Nowadays, with the wind blowing all the fines around, it's worth the risk of missing the pile entirely to get APXS on the pile before it blows away. As the animation below shows, they were successful! On sol 1532, no dump pile; on sol 1533, a nice mountain of drill fines; on sol 1534, well -- see for yourself. On sol 1533, Curiosity dumped the leftover powder from the sample it had drilled at Sebina on sol 1495. Overnight, the rover placed the APXS instrument on the engineers' best-predicted spot for the location of the dump pile. In the morning of sol 1534, only a small amount of the reddish dump pile remained, the material that had been protected by APXS overnight. The rest had blown away in the wind. In its place, a broad pile of larger, darker sand grains that had fallen in the wind shadow made by the rover turret. That's it for now! Below please find all the USGS updates for the period covered in this blog post, copied from their original location on the USGS Astrogeology website. With the weekend plan, we officially started our drill campaign on the target “Sebina,” so we will be staying in this location through the week. On Sol 1491 we dumped out the post-sieve sample from our previous drill hole at “Quela”, and did some brushing on Sebina, followed by APXS and MAHLI imaging. On Sol 1492, the rover did a lot of remote sensing, starting off with an early morning suite of atmospheric observations using Navcam and Mastcam. Mastcam also had a 360 degree mosaic from our current location. In the afternoon on Sol 1492, Mastcam had a multispectral observation of Sebina and a couple more atmospheric dust measurements. ChemCam then had a passive sky observation, followed by analysis of Sebina as well as to concretions named “Musserra” and “Mussende”. This was followed by a Mastcam documentation mosaic of all three targets. And that was all! Even though this was a weekend plan which would normally cover three sols, Sunday was a “soliday” which means there was no planning. This allows our schedule on Earth to sync back up with Mars so we can plan every day this week. The activities planned for last weekend went well, so preparations for drilling continued on Sol 1493. In the morning, a Right Mastcam mosaic of a ridge to the west of the rover will be followed by a passive ChemCam spectral measurement of the sieved fraction of the Quela drill sample. ChemCam and the Right Mastcam will also observe a nearby bedrock exposure named "Mavinga," and Mastcam will acquire a full multispectral set of images of "Cahama." In the afternoon, Mastcam will measure the amount of dust in the atmosphere and Navcam will search for dust devils north of the rover. Later, CHIMRA will be cleaned out and MAHLI will image the Quela dump pile up close. Finally, the APXS will be placed on the dump pile for an overnight integration. When we looked at the latest data from MSL this morning, we noticed that the MAHLI and ChemCam RMI images of the Quela dump pile were unexpectedly offset from the center of the pile. After looking at more of the recent images, it became clear that the dump pile had been moved by winds! So we put together plans to repeat the ChemCam passive observation and APXS integration on the dump pile at its new position, but ultimately were not able to fit the ChemCam passive into the plan due to power limitations. We didn't want to put off the strategically-planned cross-contamination experiment, which requires significant power. Hopefully the wind won't blow away the dump pile before APXS can measure its chemical composition! 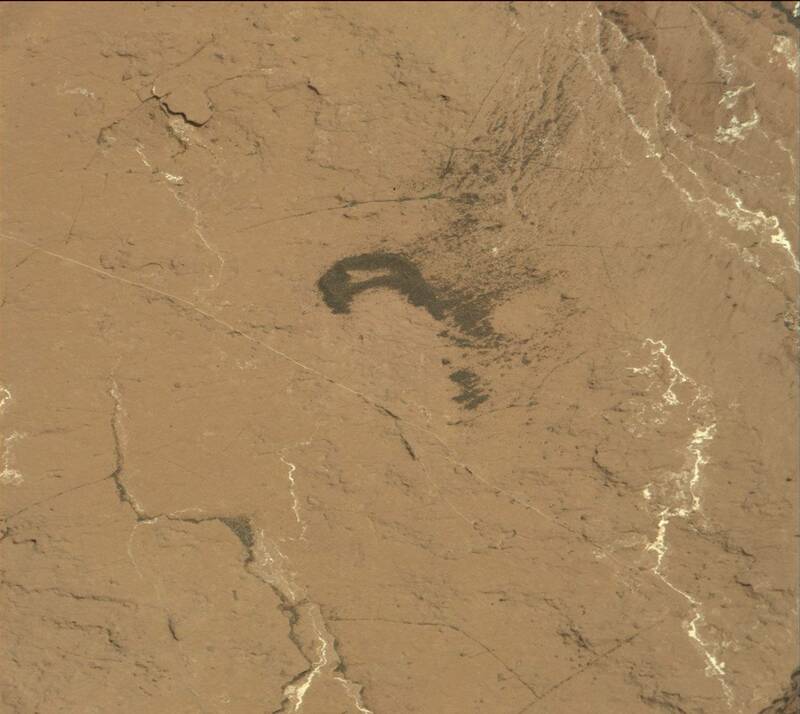 The thumbnail of the Sol 1494 MAHLI image showed that the Quela dump pile had been moved by the wind again! The MAHLI team is concerned that windblown sand and dust might damage or contaminate the camera's optics, so they decided to open the MAHLI dust cover only for images taken from 25 cm or more above the surface. Otherwise there are no concerns and a full drill hole is planned at Sebina on Sol 1495, with close-up MAHLI images taken through the dust cover window. As usual, the other MSL cameras will take images of the drill hole after the arm is moved out of the way. The drill sample will then be processed and transferred to the scoop for inspection by the Left Mastcam. It's a full plan that again requires significant power, but the tactical team was able to squeeze in a few change-detection images to watch for further changes in the dump pile. Yesterday’s plan went well and we have a new drill hole on Mars! The plan for Sol 1496 starts with a ChemCam passive observation of the dump pile of material from “Quela”, our previous drill hole. ChemCam also has passive observations of the tailings from the new hole at “Sebina”, followed by active observations using the laser. Mastcam then has some observations of the tailings and dump pile, plus an image to monitor the sand and dust on the rover deck, and a couple of atmospheric observations. Also in the 1496 plan, the drill sample from “Sebina” will be dropped off in CheMin, and MAHLI will take pictures of the drill hole and the CheMin inlet. Overnight, CheMin will analyze the sample while APXS analyzes the drill tailings. We’ve got quite a plan in store for the weekend, with every single instrument doing something, multiple arm activities, and a drive. Curiosity’s battery will be run all the way down to 35% which is quite rare, but necessary when there’s a lot to do! Sol 1497 starts off with ChemCam observations of the targets “Okambonde” and “Nokaneng” and supporting Mastcam images. Next we lift APXS off of the tailings pile it had been analyzing and take some MAHLI images of the print that it left. MAHLI also will take some pictures of the first dump pile from the “Sebina” drill hole and APXS will analyze that dump pile overnight. Also on Sol 1497, ChemCam also has some “sky flats” where we take pictures of the sky to serve as a smooth reference image to use when processing RMIs. On Sol 1498 MAHLI will take some pictures of the APXS print left in the Sebina dump pile, the REMS UV sensor, and then will take its own sky flats! ChemCam has a passive observation of the Sebina dump pile, followed by active observations of the dump pile, the drill tailings, and the targets “Coemba” and “Luma Cassao”. Mastcam will provide supporting images for the ChemCam and do some more monitoring of sand and dust on top of the rover deck. In the morning of Sol 1499, SAM has an engineering test, and Navcam and Mastcam have a bunch of atmospheric observations. Later in the day, ChemCam will observe “Nokaneng” again. Originally this observation was going to be on a different target, but it turned out that the rover’s arm was going to be in the way. Mastcam will take some pictures of the “Quela” dump pile, another ChemCam support image of “Nokaneng” and some more atmospheric observations. Finally, we’ll do a short drive. Originally the plan was to continue along our traverse toward Mt. Sharp, but the team decided to change the drive a bit to get into position for some imaging next week. MARDI will take an image of the surface after the drive, and of course REMS and DAN will continue their normal ongoing data collection. Phew! It was a marathon of a planning day, but it’s good to be getting the most science possible out of our hard-working rover! Over the weekend Curiosity completed her investigation of the “Sebina” drill site, and we’re back on the road again. Before we hit the road we took another MAHLI image of the drill hole, and noticed just how quickly the wind has swept away the fines. The two images above were taken one sol apart. Looks like a windy day on Mars! Today’s plan is focused on targeted remote sensing and driving. The morning science block includes ChemCam observations on the targets “Ranaka” and “Seleka” to assess the composition of the local bedrock. It also includes several Mastcam mosaics to investigate sedimentary structures. Then we’ll aim to drive for about 30 m to continue working our way up Mt. Sharp. After the drive we’ll take standard post-drive imaging for targeting and context. Hard to believe it’s been 1500 sols already! 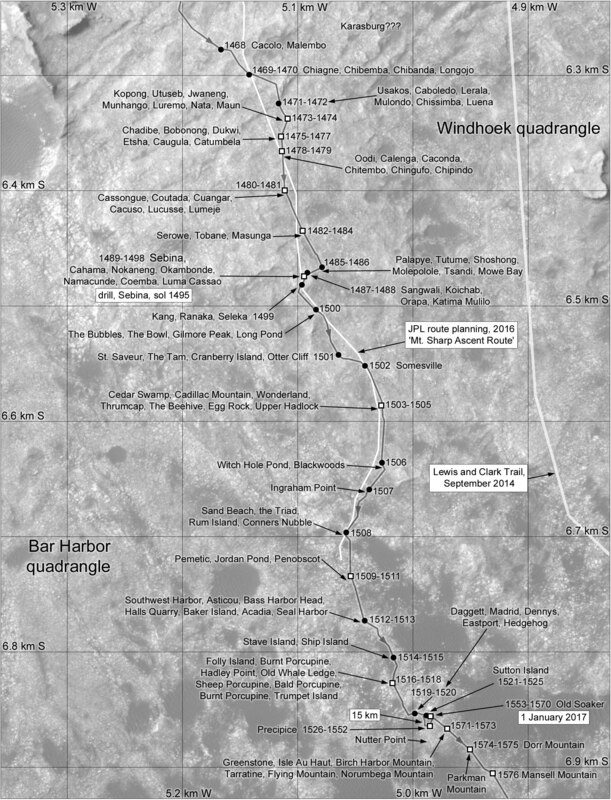 On Sol 1500 Curiosity drove 30 m to the south, crossing into a quadrangle that we informally named “Bar Harbor,” after Bar Harbor, Maine. As a reminder, prior to landing we divided up the landing ellipse and nearby areas into square quads (1.5 km on a side), and assigned each quad a name of a town with a population of less than 100,000 people. As Curiosity investigates rock targets within a quad, we assign names to the targets that correspond to geologic formations and features from that town on Earth. After driving through the “Windhoek” quad for quite some time, we are now in the “Bar Harbor” quad, and the naming scheme will follow names from that town. Today’s plan is another remote sensing and driving sol. The plan begins with ChemCam observations of “The Bubbles” and “The Bowl” to characterize the local Murray bedrock. Then we’ll acquire Mastcam mosaics of “Gilmore Peak” and “Long Pond” to assess some possible cross-stratification in the Murray formation. After another drive to the south, we’ll acquire post-drive imaging, which includes Navcam and Mastcam drive-direction mosaics (with some additional frames to capture more of the “Gilmore Peak” outcrop), a Navcam mosaic of the ChemCam targetable region, a Mastcam clast survey, and a standard MARDI image for documentation of the terrain below the rover. Overnight, Curiosity will carry out a CheMin analysis of the “Sebina” sample. Yesterday’s 46 meter drive went well, and the plan for Sol 1502 is to have another pretty typical remote sensing and driving sol. The Sol 1502 plan starts out with ChemCam observations of the bedrock target “St. Saveur” and an interesting transition between light-toned and dark-toned alteration called “The Tam”. Mastcam will document those two targets, and then collect mosaics of two Murray bedrock targets “Cranberry Island” and “Otter Cliff”. After that, Navcam and Mastcam have some observations to continue monitoring the amount of dust in the atmosphere, and Mastcam will also add to the Sol 1501 drive direction mosaic. After that, Curiosity has a short drive that should put us in position on a small hill, followed by some post-drive imaging. Everything went well in yesterday’s plan, with our drive taking us 25 meters farther along our “Mt. Sharp Ascent Route.” We started the day with some challenges caused by connectivity issues with team members outside of the US, particularly the ChemCam team. They were able to get at least one computer connected to JPL, however, so we were able to plan without too much trouble overall. Today’s plan for sol 1503 is pretty straightforward: We start off with a ChemCam observation and Mastcam documentation of the target “Somesville” to study how the composition of the bedrock changes across a light-to-dark transition. After that, we will drive and then do post-drive imaging, including some extra Mastcam and Navcam coverage. I dialed in to operations today to advocate adding a couple of Navcam images of Mt. Sharp so that over the weekend we can do a long-distance RMI observation. It’s Friday, so that means we have another busy weekend plan! Our 37 meter drive yesterday brought us to a very interesting location with lots of targets to choose from in front of the rover. The weekend plan starts off on Sol 1504 with ChemCam and Mastcam observations of the veins “Cedar Swamp” and “Cadillac Mountain.” After that the arm will reach out and MAHLI will observe the target “Wonderland” and APXS will analyze several locations on the target “Thrumcap”. On Sol 1505, Mastcam will begin a series of change detection observations of a location called “The Beehive”. Mastcam will also do some multispectral observations of the targets “Thrumcap” and “Egg Rock”. ChemCam has a calibration observation, followed by a long distance RMI observation of Mt. Sharp that I requested. ChemCam also will analyze the interesting dark rock “Egg Rock” and a possible alteration halo at “Upper Hadlock.” Mastcam will continue periodically observing “The Beehive” throughout Sol 1505 and into the morning of 1506. Then around midday on Sol 1506, Curiosity will drive and collect post-drive imaging for Monday. Happy Halloween from Mars! Over the weekend Curiosity drove 51 m further to the south, and we continue to investigate the Murray formation. I was the GSTL and KOP today (what a treat!) and we had a busy morning trying to decide whether or not to do contact science or more remote sensing. We decided to forego contact science in favor of some additional ChemCam and Mastcam observations. In the spirit of Halloween, today’s targets include “Witch Hole Pond” and “Blackwoods” to assess the chemistry of the Murray formation and to investigate some interesting sedimentary structures. We’ll also use Mastcam for environmental monitoring to measure the opacity of the atmosphere. Then Curiosity will drive about 30 m to the south, and we’ll take post-drive imaging to prepare for targeting and the potential for touch-and-go contact science tomorrow. Overnight, Curiosity will be working the graveyard shift to perform another CheMin analysis of the “Sebina” sample. Happy Halloween! MSL drove almost 30 meters on Sol 1507, into an area with more dark sand than we have been seeing recently. Because only a few rocks are exposed in the arm workspace, the tactical team decided against contact science in favor of maximizing the drive distance on Sol 1508. The view ahead is good enough to allow a drive of up to 50 meters, but will require more time so we couldn't squeeze in many pre-drive observations. Mastcam will acquire a full multispectral set of images of "Thunder Hole," an area about 500 meters away that shows evidence for clays in data acquired from orbit. Then ChemCam and Mastcam will observe a bedrock target named "Ingraham Point." After the drive and taking the post-drive imaging we will need to pick targets tomorrow, AEGIS will again be used to autonomously select a target and acquire ChemCam data. MSL drove another 44 meters on Sol 1508, ending up in an area that again is partly covered by dark sand. There aren't any very compelling targets within the arm workspace, so we decided again to forgo contact science, and focused instead on remote observations. Planning is restricted, so we are planning 2 sols today. On Sol 1509, Navcam will search for dust devils and ChemCam will acquire passive spectra of "Ellsworth," another target in the area about 500 meters away where orbital data indicate the presence of clay minerals. ChemCam and the Right Mastcam will also observe a nearby sand target named "Sand Beach," a vein target called "The Triad," and a typical bedrock target dubbed "Rum Island." The Right Mastcam will then acquire a 5x1 mosaic of Ellsworth and "McFarland Hill" and a 3x1 mosaic of nodule-rich bedrock at "Connors Nubble." A 4x1 Left Mastcam mosaic is also planned, to survey nearby sedimentary structures and nodules. The rover will drive again later that afternoon, and images will be acquired to set us up for contact science (including brushing) this weekend. ChemCam will then observe a target selected using AEGIS, and CheMin will perform another analysis overnight. On Sol 1510, ChemCam will perform multiple calibration activities. We're hoping that we'll be in a good position for contact science after the Sol 1509 drive! After driving over 40 meters on Sol 1509, MSL is ready for the 3-sol weekend plan. There are a couple of good-sized outcrops in the arm workspace, so we're planning contact science on Sol 1511. But first, Navcam will look for clouds and ChemCam will observe bedrock targets named "Pemetic," "Jordan Pond," and "Penobscot." The Right Mastcam will then image Jordan Pond, Pemetic, and the ChemCam target selected by AEGIS on Sol 1509, and acquire a 9x3 mosaic of sedimentary structures southwest of the rover. Later that afternoon, the DRT will brush off Penobscot and MAHLI will image the brushed spot and Pemetic from 25, 5 and 1 centimeter. The APXS will be placed on Pemetic for a pair of integrations that evening, then placed on Penobscot for an overnight integration. On Sol 1512, Mastcam will acquire a 5x4 stereo mosaic of the outcrop around Penobscot and a multispectral observation of the brushed spot. Next, MAHLI will image the rover wheels at 5 locations separated by small "bumps" to monitor wheel wear. Then it's time for another drive and the post-drive imaging needed for a potential "touch and go" on Sol 1514. Sol 1513 starts with another ChemCam observation using AEGIS and Mastcam measurements of atmospheric dust opacity. Finally, CheMin will read out the data resulting from the recent analysis of empty sample cells and MARDI will acquire another image during twilight. The rover will then get some well-earned rest and charge her batteries overnight. It was a busy morning for me and the other MAHLI/MARDI uplink leads, but we're happy with the plan! Our weekend plan was successful, with lots of good observations and a 43 meter drive. Today’s 2-sol plan starts out with a brief contact science block, during which MAHLI will observe the target “Southwest Harbor”. After that, we have a remote sensing block. ChemCam will observe some nodules in the targets “Asticou” and “Bass Harbor Head”. Mastcam will document those targets, as well as the Sol 1513 ChemCam AEGIS target. Mastcam also will take images of a laminated target called “Halls Quarry”, some nearby blocks called “Baker Island” and “Acadia”, and some cross-bedding in the target “Seal Harbor”. After the remote sensing block, the rover will drive and then do post-drive imaging and a ChemCam AEGIS observation. On Sol 1515, ChemCam has a passive sky observation, and Navcam has a couple of atmospheric monitoring observations. We’re continuing to make steady progress, with successful drives interspersed with plenty of good science. In the Sol 1516 plan, we started off with a Mastcam mosaic of “West Mesa” to study the stratigraphy, followed by a big 5x5 point ChemCam analysis on the nodular target “Ship Island” which brings ChemCam to more than 400,000 laser shots! ChemCam also analyzed the target “Stave Island” and Mastcam documented both targets as well as the auto-targeted location from Sol 1514. Mastcam rounded out the science block with a small mosaic of some interesting dark rocks. After that, Curiosity drove, and ChemCam did another auto-targeted observation. Sol 1517 was pretty simple, with a Mastcam image of the rover deck, Navcam atmospheric monitoring, and a twilight MARDI image. The Sol 1516 drive brought us to a sandy location, so the Sol 1518 plan takes advantage of that location to study the sand. The plan starts out with Mastcam observations to monitor the amount of dust in the atmosphere, followed by ChemCam observations of “Folly Island”, “Burnt Porcupine”, “Hadley Point”, and “Old Whale Ledge”. Mastcam will document all of those targets, plus the AEGIS target from Sol 1516. Mastcam also has an observation to extend the mosaic of the workspace. With the remote sensing done, MAHLI will image “Folly Island” and the sandy targets “Sheep Porcupine” and “Bald Porcupine”. APXS will also measure Sheep Porcupine and Bald Porcupine. Late in the day, Mastcam will repeat the observations of atmospheric dust. On Sol 1519, we have a short drive with the usual post-drive imaging, and ChemCam will do another automated observation. Sol 1520 is an untargeted Sol, so we are focusing on imaging distant targets. Mastcam has a mosaic of the upcoming “Hematite Ridge”, ChemCam has a long-distance RMI of Mt. Sharp, and NavCam will look to the northern horizon to measure the dust in the atmosphere. Curiosity continues to drive across bumpy terrain of the Murray formation. 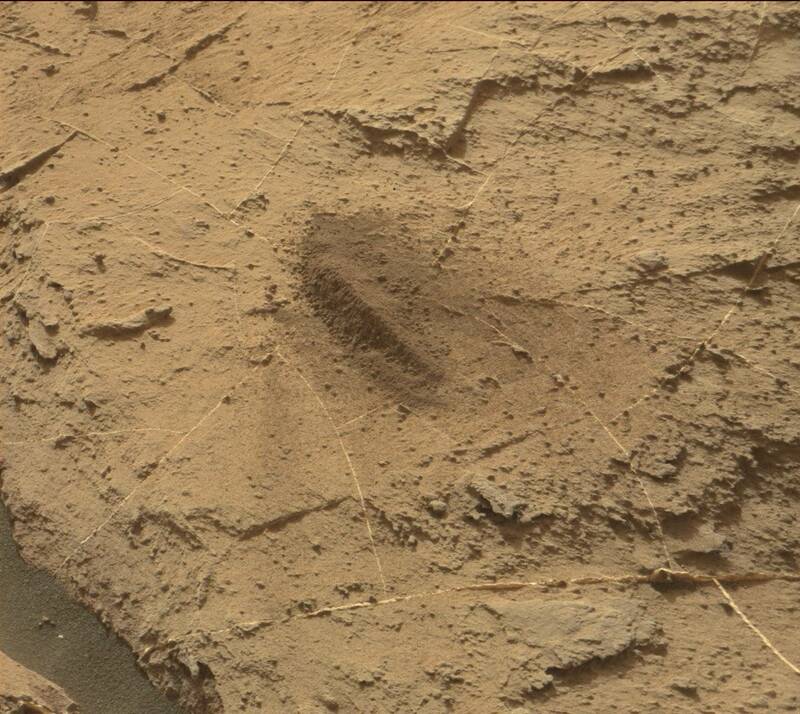 Over the weekend, Curiosity drove ~36 m, making good progress toward our next drill site. Today’s two-sol plan starts with several ChemCam observations to assess the chemistry of the local bedrock and veins. We’ll also acquire a long-distance ChemCam RMI mosaic to examine layers in Mt. Sharp. Then Curiosity will acquire Mastcam images to document the ChemCam targets as well as to evaluate the stratification exposed in nearby outcrops. We’ll also take several Navcam images to search for dust devils and monitor cloud activity. After the drive, we’ll take Navcam and Mastcam images of the workspace to prepare for contact science in the next plan. In the afternoon, Curiosity will acquire a ChemCam AEGIS observation. In the early morning of Sol 1522, Curiosity will perform a few environmental monitoring observations to evaluate atmospheric opacity and to search for clouds. I’ll be on duty on Wednesday, so I’m looking forward to a fun day of contact science! On Sol 1521 Curiosity drove 11 m to the east, which set us up to investigate a darker-toned outcrop known as “Sutton Island,” seen in the middle of the above Mastcam image. Today’s plan is focused on contact science to study the grain size, stratification, and chemistry of the “Sutton Island” outcrop. I was the GSTL today, and it was a busy day of planning! It took a while to find contact science targets that we could safely reach with the DRT, MAHLI and APXS. Eventually we found targets that would work, and we planned MAHLI and APXS on two distinct parts of the outcrop, including a DRT location on the top of the outcrop to analyze a clean brushed surface. We were also able to plan a MAHLI “dogs eye” mosaic to investigate the stratification at a target known as “Seawall.” In addition to contact science, we planned ChemCam observations of the targets “Duck Harbor,” “Islesford,” and “Sutton Island,” to look for changes in chemistry. Overnight, Curiosity will acquire APXS integrations on the two different contact science targets. Then on the second sol we’ll use all of the Mastcam filters to assess the spectral properties of this different outcrop. Later in the afternoon we’ll take a large Mastcam mosaic for geologic context, and Curiosity will perform a ChemCam calibration activity. The MAHLI images from Sol 1523 are down, and we acquired some beautiful images of this new outcrop, as seen in the above image of the target "Seawall." Today’s plan is focused on finishing the investigation at “Sutton Island,” and then driving towards the next drill target, ~9 m away. The plan starts with a couple of Navcam and Mastcam observations to monitor the opacity of the atmosphere and search for clouds. Then we’ll acquire ChemCam observations of “Ironbound Island” and “Goat Trail” to assess the composition of the bedrock. The plan also includes several Mastcam mosaics to characterize the geometry of this deposit and document its sedimentary structures. In the afternoon Curiosity will acquire MAHLI images of “Ironbound Island” to characterize the more typical Murray bedrock in this area, followed by an overnight APXS integration on the same target. On the second sol Curiosity will drive toward the next drill target as we continue our systematic campaign of sampling the Murray formation. After the drive we’ll take post-drive imaging, including workspace imaging to prepare for upcoming contact science and characterizing the intended drill site. We’ll also take a ChemCam AEGIS observation on the second sol. In addition to all of these activities, the rover will perform a SAM atmospheric observation to look for methane. Quite the weekend for Curiosity! Our weekend plan went as expected, including a ~16 meter drive which brings us to our next drill target: “Precipice”. That drive also brings our total drive distance from Bradbury Landing to just over 15 km! We have a three sol plan today as we head into the long holiday weekend and prepare for drilling next week. On Sol 1528, Mastcam has a 3x10 mosaic to provide context for the drill site, followed by ChemCam images of the drill bit and a MARDI twilight image of the ground beneath the rover. On the following sol, Navcam and Mastcam start the day with a set of atmospheric observations to watch for dust devils and measure the amount of dust in the atmosphere. After that, ChemCam has a passive sky observation, followed by active measurements of the targets “Thomas Bay”, “The Anvil”, and “The Ovens”. Mastcam then has a change detection observation on the targets “Hulls Cove” and “Big Heath” along with documentation of the ChemCam targets, including the AEGIS target from sol 1526. Mastcam and Navcam will then repeat some of the atmospheric observations from the morning. In contrast to our busy Sol 1529, sol 1530 will be relatively quiet, with a focus on downlinking data and our normal background data collection from REMS and DAN. Today’s plan covers sols 1531-1533, which will take us through the Thanksgiving holiday weekend. We are in place at our next drill location “Precipice” so there will be no driving in the plan, just a lot of science and preparation for drilling! Sol 1531 will start off with ChemCam observations of Precipice as well as the targets “Frenchman Bay” and “Hunter’s Beach”, followed by Mastcam documentation of all three targets. I also managed to fit a request for some Navcams of Mt. Sharp in the Sol 1531 science block to enable some long distance RMI observations next week. After the science block, the rover will do the “pre-load test” on our drilling target to improve the accuracy of the drill next week. Precipice will also be brushed off, and APXS will settle in for an overnight measurement. On Sol 1532, Mastcam starts off with an observation of the distant foothills of Mt. Sharp, multispectral imaging of the Precipice target (along with the associated calibration target), and imaging of the rover deck to watch for changes in the sand and dust that have collected there. Mastcam will also take a stereo image of the location where the previous drill sample will be dumped. ChemCam has an observation of a target called “Breakneck Pond” which will then be documented by Mastcam. We will round out the science block with Mastcam and Navcam atmospheric observations. Finally, on Sol 1533, we will dump out our previous drill sample and do an APXS measurement on the dump pile. While the rover is busy with all of that, the Americans on the MSL team will be celebrating Thanksgiving, and thinking about how thankful we are that we get to work on such an amazing project with such great colleagues! Curiosity had a productive Thanksgiving weekend and now we are getting ready to drill at “Precipice.” Sol 1534 begins with MAHLI imaging of the post-sieve dump pile from the previous drill sample (“Sebina”). Then we have a short science block to acquire a ChemCam passive observation and a Mastcam multispectral observation of the dump pile. In the afternoon the plan includes a CHIMRA “thwack” activity to clean out any remnants of the previous sample in order to prepare for a new one. Later in the afternoon we’ll also take a ChemCam long distance RMI mosaic to investigate a linear feature observed from HiRISE. The full drill hole is planned for Sol 1536. The current drill campaign continues to go smoothly, and the Sol 1535 plan is dominated by an experiment to see if any Sebina sample material is left inside the drill bit chamber from the previous drilling. This is motivated by the fact that we only used vibration to transfer that sample from the drill bit assembly into CHIMRA, rather than also using percussion. So it’s a “cross-contamination experiment” designed to see if the vibration didn’t do a complete job back when we first drilled Sebina. Lots of images of the sieve and other parts of CHIMRA will be taken to verify that the system is clean. These activities will take a fair amount of time and power, but we were able to squeeze a few remote science observations into the plan: ChemCam will shoot its laser at bedrock targets named "West Tremont" and "Eastern Head," and the Right Mastcam will image the same targets. The Left Mastcam will also examine fracture patterns at "Sawyer's Cove." Finally, Navcam will search for clouds north of the rover. If all goes well, drilling will be planned tomorrow! The cross-contamination experiment and cleaning of CHIMRA went well, so we are ready to drill into the Precipice target! Past drilling activities have made use of both rotation and percussion, but percussion has caused intermittent short circuits occasionally since Sol 911, so on Sol 1536 we will test the ability of the drill to acquire a sample using rotation only, without percussion. We expect that the Precipice target is soft enough that the experiment will go well, but of course we won't know until we try! Drilling and associated imaging will require enough power and time that additional observations could not be added to the plan. Unfortunately, the much-anticipated rotary-only drilling experiment did not even start due to a drill fault that is currently being investigated. This type of drill fault appears to be unrelated to the previous short circuits during percussion, but more study is needed. So the tactical planning team had to scramble to put together a plan while the drill experts work to recover from this anomaly. Luckily, the fault did not preclude non-drilling arm activities, so we picked the bright target "Thomas Bay" for contact science. We were also able to fit a lot of remote science observations into the plan: A Navcam cloud movie, a Right Mastcam mosaic of "Squid Cove," Mastcam measurements of dust in the atmosphere, and a small Mastcam stereo mosaic of "Baldwin Corners." At various times of day, Navcam and Mastcam will image the ground toward and opposite the azimuth of sunset to measure the photometric (light scattering) properties of the rocks and soils near the rover. ChemCam and the Right Mastcam will also observe bedrock target "Compass Harbor" and vein targets "Bartlett Narrows" and "Birch Point." After drill diagnostics are performed, more Mastcam dust measurements and images of "Hulls Cove" and "Big Heath" are planned. It was a busy day for me and the other MAHLI uplink leads, as we had to modify our command sequences to take images with MAHLI's dust cover closed and find the best time to take images in full sunlight. Since the fine-grained Sebina sample was dumped, we are concerned about material blowing onto MAHLI's lens and sticking to it. Finally, the APXS will be placed on Thomas Bay for an overnight integration. The RPs are going to take a little more time to diagnose the drill fault before we drive or use the arm again, so today’s plan is focused on targeted remote sensing. We’re still at the “Precipice” site, assessing the composition and sedimentary structures in the Murray bedrock and carrying out some long distance observations. Today’s plan includes a long distance ChemCam RMI mosaic to monitor linear features observed from HiRISE and another RMI mosaic to investigate the stratigraphy exposed in a butte called “Ireson Hill.” The plan also includes a Mastcam mosaic to search for fracture patterns in the vicinity of “Squid Cove,” and a Mastcam clast survey for change detection. The weekend plan returned some great remote sensing data, including the above Mastcam image of "Ireson Hill" to investigate the stratigraphy exposed in a distant butte. While we work on assessing the drill fault, the team decided to devote today’s plan to remote sensing and change detection. The plan starts with ChemCam observations of “Hunters Beach” and “Gorham Mountain” to investigate the chemistry of the Murray bedrock. Then we’ll acquire a Mastcam tau and crater rim extinction image to characterize the amount of dust in the atmosphere, followed by a Navcam dust devil search. The plan also includes a series of Hazcam observations taken approximately every hour until sunset – this will provide a very thorough dataset to monitor the movement of sand based on time of day. This is really important for planning MAHLI observations, because we’ve noticed a lot of movement of fines through this area at this time of year, and we’ve mostly been taking MAHLI images with the dust cover closed to protect the instrument. If we can better understand when and where the sand is most active, we can better plan MAHLI observations, and we can improve our understanding of the eolian environment! While investigation of the drill anomaly continues, more diagnostic tests will be performed on Sol 1542. Again, no mobility or other arm activities will be planned, so the science team added only remote sensing observations. ChemCam will observe Hunters Beach again to further investigate the the chemical variations that LIBS measured there previously. ChemCam and the Right Mastcam will also observe bedrock targets "Sargent Mountain" and "Youngs Mountain." Finally, Navcam and Mastcam will take one more set of images at 8 AM on Sol 1543, to complete the photometry dataset started on Sol 1537. The Sol 1542 drill diagnostics did not complete as intended, and as a consequence, neither did some of the later science activities. Therefore, those tests and activities from Sol 1542 will be planned again on Sol 1543. But first, ChemCam will shoot its laser at a target near Hunters Beach, called "Bracy Cove," and at the bright layers just above The Anvil. Late in the afternoon, ChemCam will perform a routine observation of its titanium calibration target, the Left Mastcam will acquire a 5x1 mosaic of "Squid Cove," and the Rear Hazcam will take another image to look for changes due to winds. Overnight, SAM will perform an Opportunistic Derivitization experiment on a sample from Cumberland that we’ve been carrying since early in the landed mission. This experiment has been some time in the making and should improve SAM's ability to characterize the organic molecules within that sample. Early in the morning of Sol 1544, Navcam will search for clouds and dust devils, Mastcam will measure dust in the atmosphere, and both cameras will re-attempt the photometry observations that were planned yesterday. The plan for Sol 1544 includes remote sensing and additional diagnostics to resolve the drill feed fault. The plan starts with a Mastcam tau and crater rim extinction observation to monitor dust in the atmosphere. Then we’ll acquire ChemCam observations of “Aunt Betty Pond” and “Kebo Mountain” to assess the composition of the Murray bedrock and veins. In the afternoon we’ll repeat the Mastcam tau and crater rim extinction observations. We’ll also take a few more rear Hazcam images to monitor the movement of fines at different times of day. For more on the drill feed anomaly and our steps to resolve the issue, check out this recent press release. In the meantime, the science team is getting ready for the American Geophysical Union conference next week, so we had some great science discussion presentations that will be shared at the meeting next week! This morning we received downlink that indicated operation of the drill feed using standard commands. This is great news, and the anomaly response team has cleared the rover for use of the arm and driving (but not yet drilling). In today’s plan, we’ll wrap up work at the “Precipice” location and drive to a nearby site to investigate some interesting fracture patterns. The 3-sol plan weekend plan starts with another Mastcam tau and crater rim extinction observation to monitor dust in the atmosphere. This is followed by ChemCam observations of “The Anvil” and “Blue Hill” to investigate variations in chemistry in the Murray bedrock. 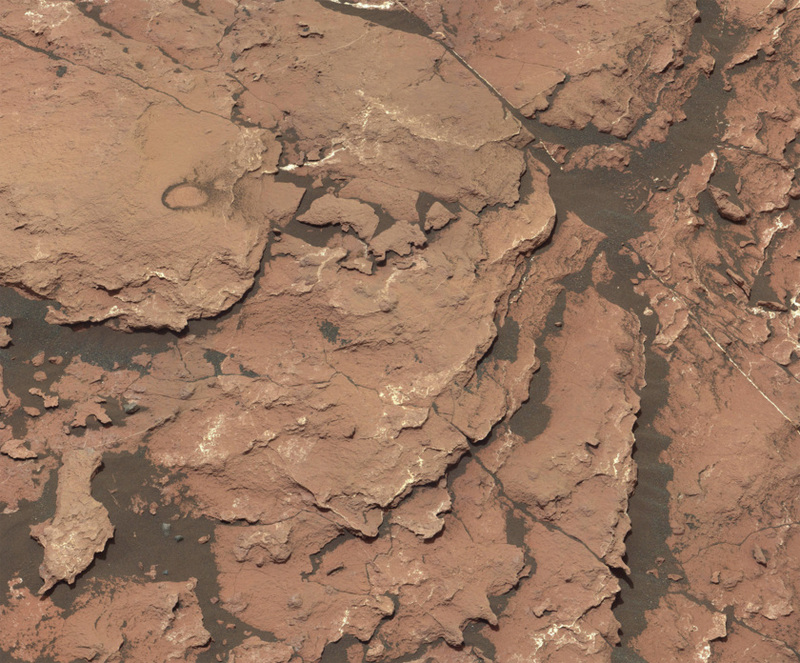 We’ll also take a Mastcam mosaic to provide additional context for the “Precipice” site. In the afternoon we have a juicy arm backbone which includes MAHLI imaging of “Echo Lake,” “Beachcroft,” and “The Anvil,” with a short APXS integration on “Beachcroft” and an overnight integration on “Echo Lake.” This should return a great dataset to understand the chemistry and sedimentary structures here. On the second sol, Curiosity will acquire a ChemCam observation of “Western Head,” an area that showed some unusual color variation. We’ll also extend the Mastcam mosaic of “Squid Cove” and take a couple of Navcam movies to monitor the atmosphere. Throughout the plan we’ll take several front and rear Hazcam images for additional change detection observations. There’s also an overnight SAM activity using the EGA, which makes use of the residual derivatization vapor in the sample manipulation system. Then on the third sol we’ll drive toward the region with fractures, and take post-drive imaging to prepare for possible contact science next week. It’s great to be moving again with a very full weekend plan! Loving that Egg Rock. Meteorites look so weird on Mars, having never had the chance to oxidize.